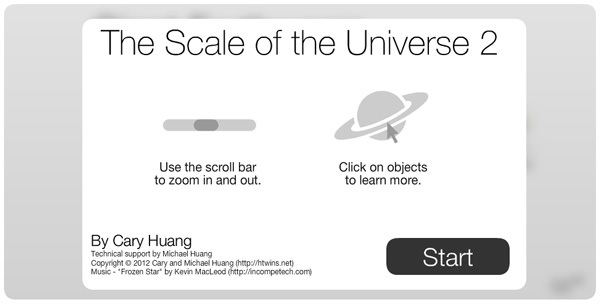 The Scale of the Universe 2 is a brilliant application that provides a captivating, highly educational visualization of the scale of our universe, from the still-theoretical quantum foam (1 x 10-35 meters) to the universe itself (1.6 x 1027 meters). What makes the tool even more impressive is that it was created by two 14-year old brothers from California, Michael and Cary Huang. According to ABC News, The Scale of the Universe project was created just for fun, after brother Cary saw a presentation from his seventh grade science teacher on the relative sizes of cells. He envisioned making a version with a much larger range of sizes. The result is a virtual walk-through of the universe that is so well done it has even been profiled by NASA. Users begin their journey at human size (1.7 meters), and can move outwards—exploring moons, suns, galaxies and galactic clusters along the way—or inwards—through microorganisms, molecules, atoms and subatomic particles—using a simple slider bar. For every object, The Scale of the Universe offers information about its size and a short educational blurb. There's even an ethereal soundtrack to set the mood. I've found The Scale of the Universe fascinating enough that I've returned to it time and again, always uncovering a new tidbit that I missed previously. And my kids—4, 8 and 11 years-old—also enjoy exploring its objects, even if the concept of the scale is still a little tricky for them to grasp. Though they can be forgiven—62 orders of magnitude is a tough concept for anyone, even with a great tool like Scale of the Universe to guide us!